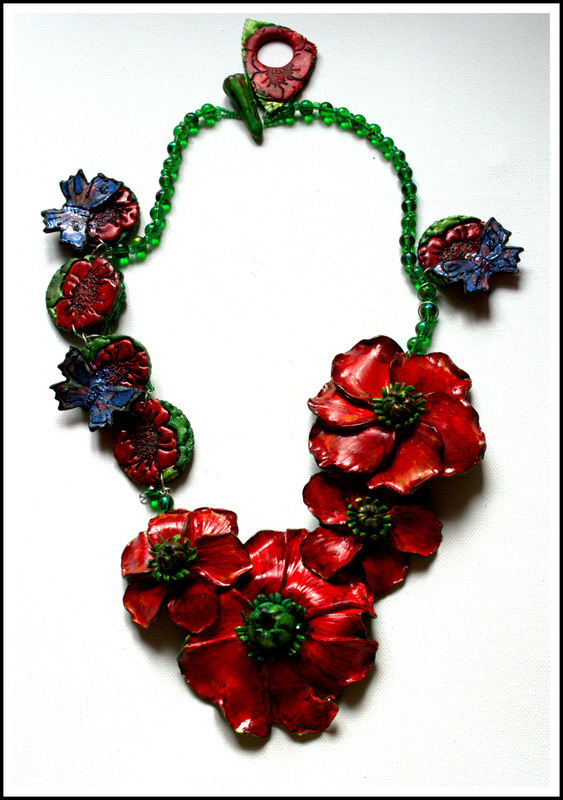 This is my entry to this month’s Art Bead Scene’s challenge. 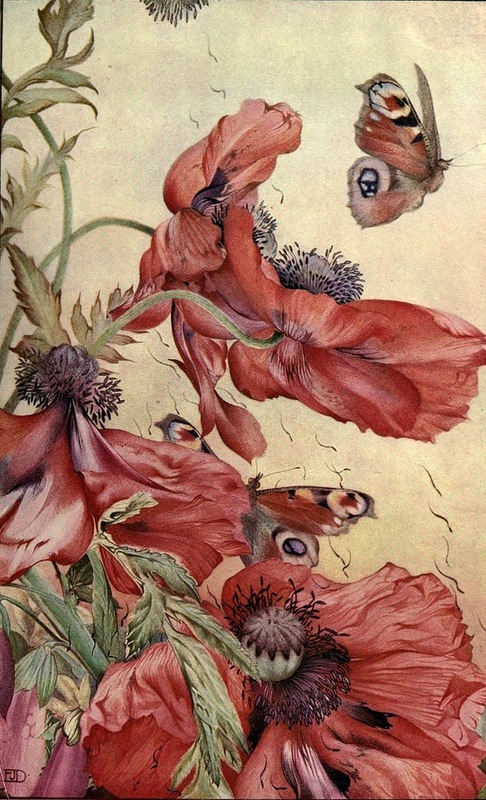 The inspiration was a poppy illustration, named Amapolas, made by Edward Julius Detmold. 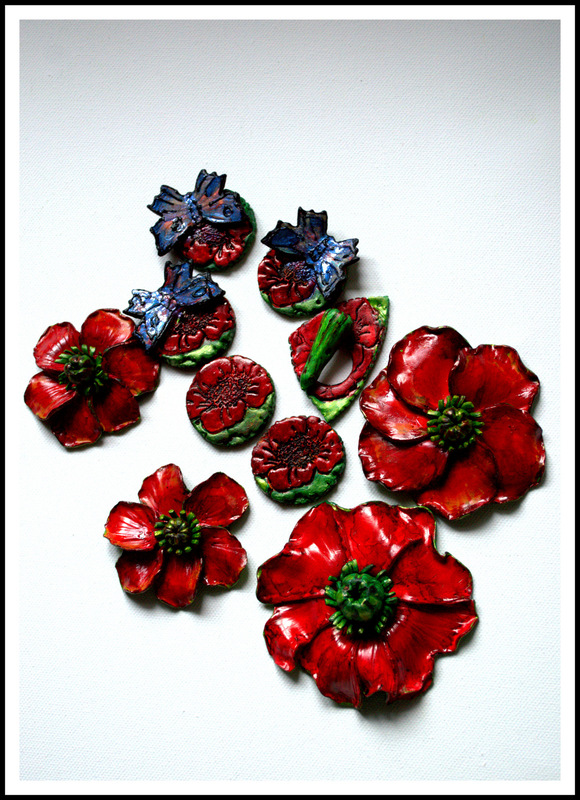 I have made the art beads from polymer clay, and once out of the oven , I have painted them with alcohol inks and acrylics. I found the perfect green glass beads to put the pieces of the puzzle together. I can say I am happy. 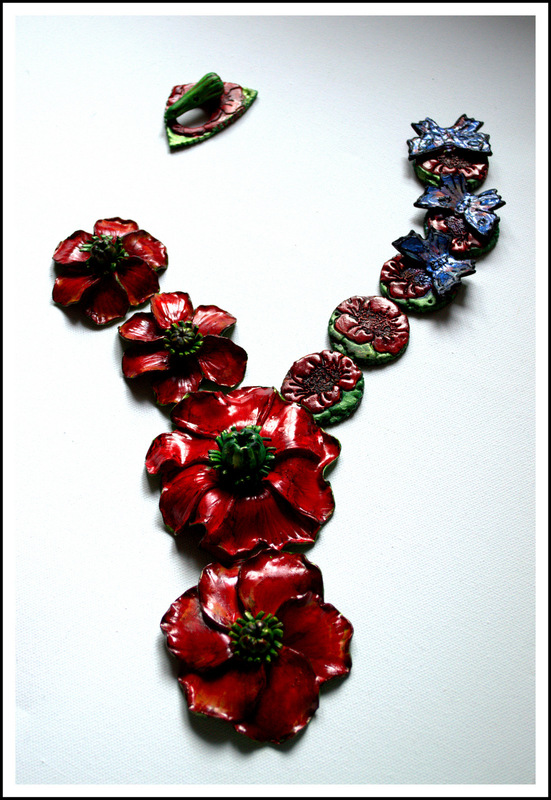 Now I have the center piece for my Flower Collection, which is inspired by poppies. 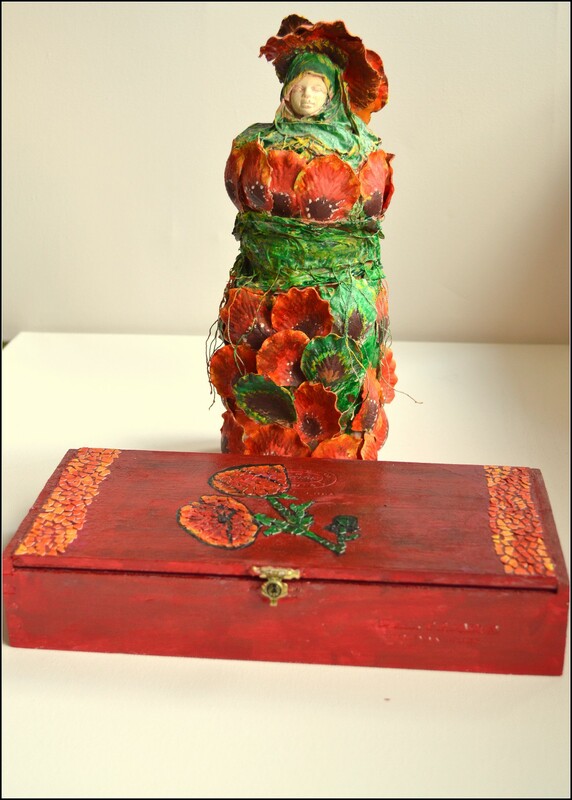 I have made the Powertex Statuette, the egg-shell mosaic box and the fabric painting and I was happy with the result, but I was unable to decide on the shape, form and beads for the necklace that goes with the rest of the collection. Now I have the missing piece. 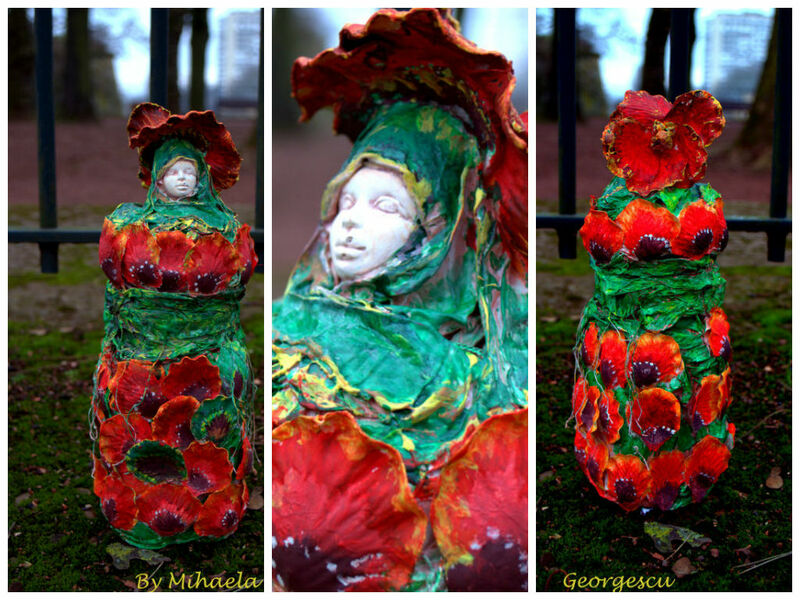 I wanted to add this : I loved this month’s inspiration image, as a love poppies. 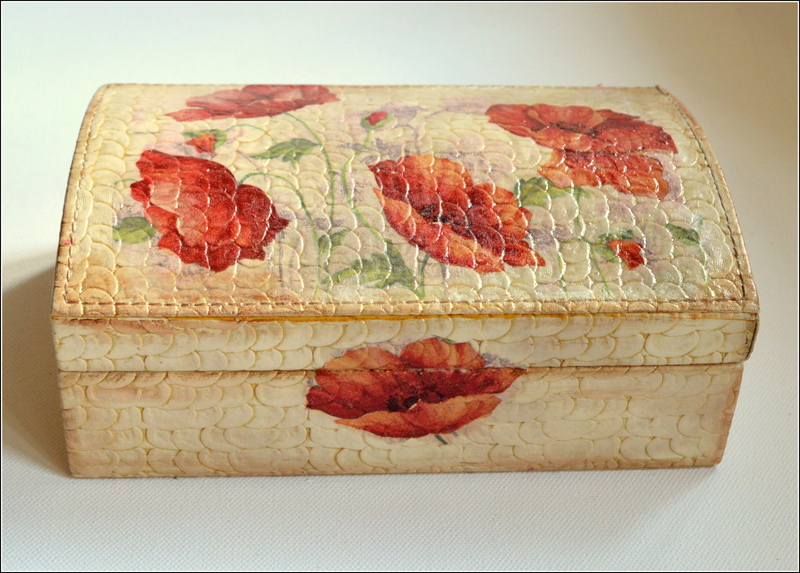 We can judge by the fact that I am surrounded by poppies : I decoupaged poppies everywhere ! I am so happy you like it! Thank you for taking the time and writing your comment! WoW thr necklace looks fab !!! Richly luscious. Exquisite. I love each piece you made! And by the way, I know just the hotel for you in Chiangmai Thailand… The Opium Serviced Apartments and Hotel. The young owner made the whole place, including each room, an homage to the poppy. Fabulous decor! Thank you, Diana! I think I would like to visit a Hotel like that. Not to mention that I have never been to Thailand, but I intend to go there one day! Hi thank you for the follow (will def do the same). I also try my hands on beads from time to time but I don’t have the correct tools so my handmade jeweleries are pretty basic. Your necklace is beautiful. It can be used as an inspiration for another one of my basic jeweleries. Your necklace is beautiful. It can be used as an inspiration for another one of my basic jeweleries. And I dunno if you made the beige box (or is it white?) with the flowers but it is very, very beautiful. I like it very much. Wow, very beautiful poppies! Every year I hope to see this delicate flower on may. Your work also is delicate and innovative. Thanks for sharing. Thank you for taking the time and sharing your thoughts with me! 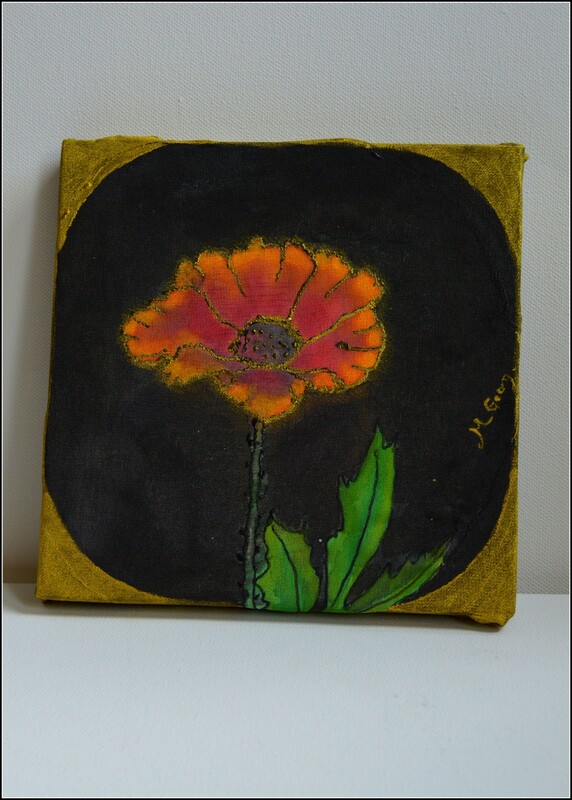 Poppies rock, Your work will last much longer than the ephemeral blossom itself. Nice work. Thank you so much, Aquileana! And I must say I love your blog posts on Greek Mythology! Great work! I do write about Personal Development very often, I just need to update my sites and get all those posts inside this site. I come from Denmark, where there are very little sun compared to Spain, so I decided to relocate to Spain to get more sun in my life. I’m happy to meet you too, you create some very exciting jewelry. Hello Irine. I knew you are from Denmark (I read it on your blog) and I admire you for the courage to relocate to a sunnier place. We are considering also to move to a sunnier place (South of France). We moved from Romania to Belgium then to France, yet we are still afraid of changing our life again. But I dream of going closer to the sea and to have more sunny days. I enjoy reading personal development articles because I consider it is very important to keep on becoming a better version of yourself. I wish you to get well very soon and I can’t wait to read your posts. I am very, very happy to have met you! Hi Mihaela. Thank you for your kind comment. Many times in my life I have moved caused a new job a new place, which I still think is a good reason to a movement. Now I am a pensioner and I don’t need to think about working in same way again, why I also could allow myself to go to Spain with a pension. It is always difficult to move to a new place and learn new people to know. I have been moving 5 times in Spain until now, so I do know. I’m happy to meet you too. 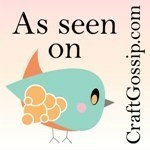 Thanks for following inspiredbybooks:) I just love your poppy jewelry & you sharing your inspiration with us! Gorgeous!! I love reading and I enjoy reading your book reflections. Thank you for your kind words! Ok now this is just cool. I love the end result from your inspiration from the painting. I’ve played around with polymer clay to make some beads a few times, as well as a few other things. I love the poppy flowers you made here. They are really awesome and unique.